How Do You Get Them Ready to Use? Unmounted Rubber Stamps are available in sheet rubber about the size of 1/2 sheet of notebook paper or 5 & 1/2 by 8 inches. Normally all of the images on the sheet are in the same family of images. Prior to use, they first need to be trimmed to the basic shape of the stamp image, and then mounted in one of several ways to clear acrylic blocks. 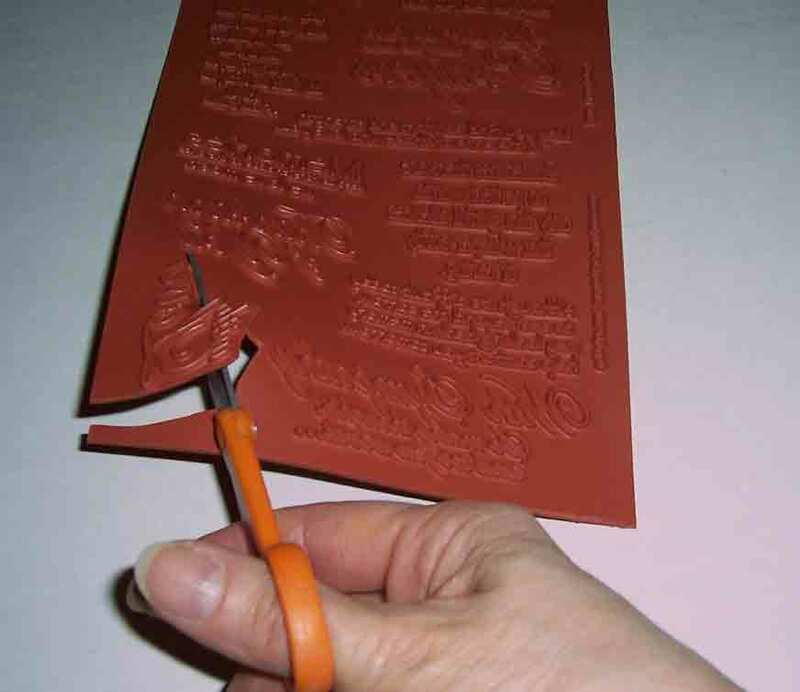 Trimming of an unmounted rubber stamp sheet should be done with very sharp scissors about 1/8 of an inch from the image, being careful not to cut into the image and not to angle the scissors. Hold the scissors so cutting the edge makes a straight up and down cut - you don’t want to under cut or over cut the edge - it can alter the image at the edge of the stamp or the way the images stamps when you ink it up. There are several advantages to Unmounted Rubber Stamps. One great advantage is the obvious space that is not taken up by the wooden blocks. Another is that when mounted on clear acrylic, the rubber stamper achieves more accurate placement of the stamped image on the final product. A third advantage is reducing the need for the wood blocks - going "Green"
Unmounted Rubber Stamps can be coated on the back with a thin coat of a repositionable adhesive such as Aleen’s Tack it Over and Over or Liquid Wacky Tac. When “dried” after about 30 minutes (depending on the thickness) the stamps will adhere to the acrylic block and can be inked, used, removed, and even cleaned with a mild soap or stamp cleaner without the “sticky” coming off. Most clear acrylic blocks are plain, but some have grid lines to aid in stamp alignment. These come in various sizes and shapes, to accommodate large stamps, or multiple stamps on the same block and long slender blocks to accommodate lettering stamps that need to be placed in a straight line. Tip: If you spill some of the adhesive or get it on you,it can be removed with rubbing alcohol and then washed off. Please be very careful with it. I dropped a bottle of it on my tile floor and I walked right out of my shoes it was so sticky. The images can be stored on plastic sheet protectors in 3-ring binders with a copy of the image on the facing page. Even more convenient is a 3-ring binder with a zipper close so in case any of the stamps come lose from the sheet protector, they will not get lost. 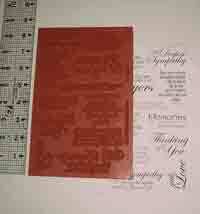 Below is a photo review of the process to cut, glue and store Unmounted Rubber Stamps. 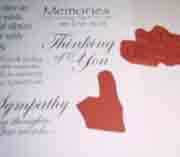 Unmounted Rubber Stamps (5 & 1/2'" by 8 1/2") sheet with printed stamp images. Cutting Unmounted Rubber with Small Sharp Scissors - Cut about 1/4 inch from the edge of the image. Place each stamp with the image up-side down to correspond with the printed stamp image sheet. All images are cut and placed "upside down" over the printed stamp image sheet. This is a good way to check that you have them all. Using Aleens Tack it Over & Over liquid pressure sensitive glue, place a little on the back of each rubber stamp. This is how your stampswill look with the liquid pressure sensitive glue before it is spread on the back. Here are 2 pages of the glued unmounted rubber stamps which have been placed on a Sheet Protector and the paper with the printed stamp images inside the sheet protector on the facing side. This allows you to view all the images you have at a glance and select the ones you want to use. This particular notebook zips closed so even if the stamps become disconnected, they will not become lost. Using a small foam brush, not your finger, carefully spread the Aleen's over the back of the rubber stamps. CAREFUL! This stuff is VERY STICKY! And very difficult to get off of anything without Alcohol. Put your stamps aside until the Aleen's dries and becomes shiny - about 30 minutes. They will not all be dry at the same time. There is one in the photo in the upper right that is still a little wet. These particular images were a group of greetings to be used with Sympathy cards, so they were all text images. They were purchased from Club Scrap as were the other images in the book and the zip-close 3-Ring binder.